Introduction: Conventionally, a combination of four separate drugs (ethambutol, isoniazid, rifampicin, and pyrazinamide [EHRZ]) is the first-line pharmacotherapy for pulmonary tuberculosis (TB). In recent years, fixed-dose combination (FDC) formulation, where a single tablet contains the active ingredients of four aforementioned drugs, is gaining popularity due to its ease of administration. Objective: To compare the real-world effectiveness of EHRZ and FDC treatment groups on a cohort registry by investigating the sputum conversion rate and treatment outcomes of both groups. Methods: A total of 11,489 patients' data were extracted from the Sabah TB registry between January 2012 and June 2016, including EHRZ (n = 4188) and FDC (n = 7301) patients. Then, 1:1 propensity score matching was adopted to reduce the baseline bias. Caliper matching was conducted with maximum tolerance score set at 0.001. Confounders included in the propensity score matching were gender, nationality, diabetes, HIV status, smoking status, and chest X-ray status. Successful matching provided 4188 matched pairs (n = 8376) for final analysis. 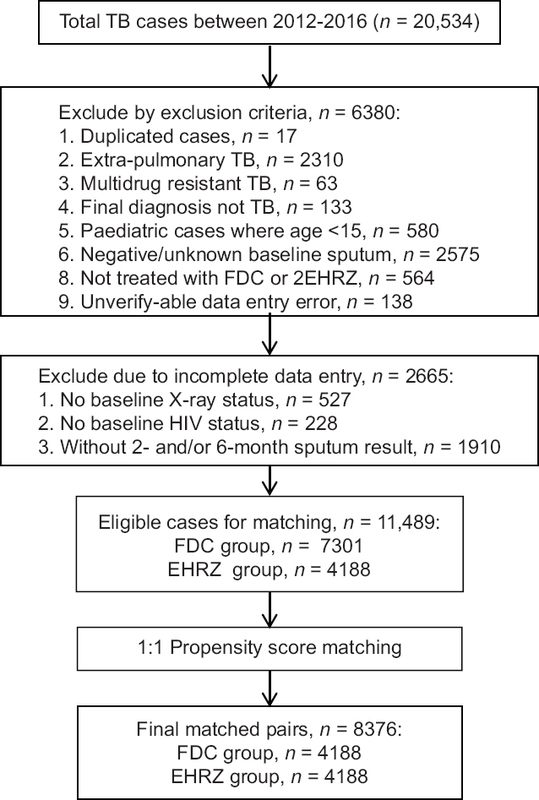 Results: In this matched cohort of 4188 pairs, the 2-month sputum conversion rate of FDC group was significantly higher than the EHRZ group (96.3% vs. 94.3%; P < 0.001) whereas 6-month sputum conversion of both groups showed no significant difference. Treatment outcomes such as noncompliance rate, failure rate, and success rate have no significant difference (P > 0.05) in both the treatment groups. There was an incidental finding of reduced death rate among FDC group compared to the EHRZ group (0.2% vs. 0.5%; P = 0.034). Conclusion: The FDC formulation has better sputum conversion rate at 2 months compared to conventional EHRZ regime as separate-drug formulation. It was also observed that FDC has a slight protective effect against all-cause death among TB patients. This protective effect of FDC, however, still needs to be proven further. Objectives: The objective is to study the clinico-epidemiological features of viral acute encephalitis syndrome (AES) cases and compare them with nonviral AES cases in children from Eastern India. Methods: This prospective observational study was conducted in the department of pediatrics of a tertiary care teaching hospital in Eastern India over 18-month period. Children (6 months to 15 years) with acute onset of fever (≥37.5°C) and a change in mental status (including symptoms such as confusion, disorientation, coma, or inability to talk) and/or new onset of seizures (excluding simple febrile seizures) were included in the study. The main outcome measures were the etiology and proportion attributed to viruses causing AES with clinical correlation. Results: Of 834 of clinically suspected AES cases, viral etiology could be confirmed in 136 (16.3%) cases (herpes simplex virus-1 [HSV-I] was most common). The 5–15 years' age group was most commonly affected (boys > girls). More cases occurred from July to November. The presence of rash and Glasgow Coma Scale <8 at admission was significantly higher in viral AES. During hospitalization, development of shock, ventilatory requirement, duration of stay, and mortality was significantly higher in viral AES. On neuroimaging, global cerebral injury was common in HSV, Japanese encephalitis, and varicella-virus AES. Conclusions: Viral etiology forms a significant proportion of pediatric AES. Morbidity and mortality are high in viral compared to nonviral AES. Herpes encephalitis (HSV-I) is the most common cause of pediatric AES in Eastern India. Viral AES has poor prognosis compared to nonviral AES. Aim: The aim of the study is to determine the factors associated with 28-day mortality in immunocompetent patients with hospital-acquired pneumonia (HAP). Methods: This was a 42-month retrospective cohort study in Chiang Kham Hospital. Patients with HAP diagnosed between January 2013 and June 2016 who did not have an immunocompromised status were recruited into the study. Statistical Analysis Used: Univariable and multivariable binary logistic regression analyses were performed to determine the factors associated with mortality in patients with HAP. Results: A total of 181 HAP patients. The most causative pathogens were nonfermenting Gram-negative bacilli. Fifty-two (28.7%) patients had died within 28 days after HAP diagnosis. Multivariable analysis demonstrated that mechanical ventilation (MV) dependency (adjusted odds ratio [OR] = 3.58, 95% confidence interval [CI] 1.53–8.37, P = 0.003), antibiotic duration (adjusted OR = 0.79, 95% CI 0.70–0.88, P < 0.001), acute kidney injury (adjusted OR = 5.93, 95% CI 1.29–27.22, P = 0.022), and hematologic diseases (adjusted OR = 11.45, 95% CI 1.61–81.50, P = 0.015) were the significant factors associated with 28-day mortality. Conclusions: The factors associated with mortality were MV dependency, HAP duration of treatment, acute kidney injury, and hematologic disease. Early recognition of these factors in immunocompetent patients with HAP and treatment with intensive care may improve the outcome. Introduction: Genital infection with herpes simplex virus type 2 (HSV-2) facilitates the acquisition of HIV, both mutually reinforcing infection. Lifelong latent HSV-2 infection raises concerns among women of reproductive age, considering the risk of neonatal transmission. 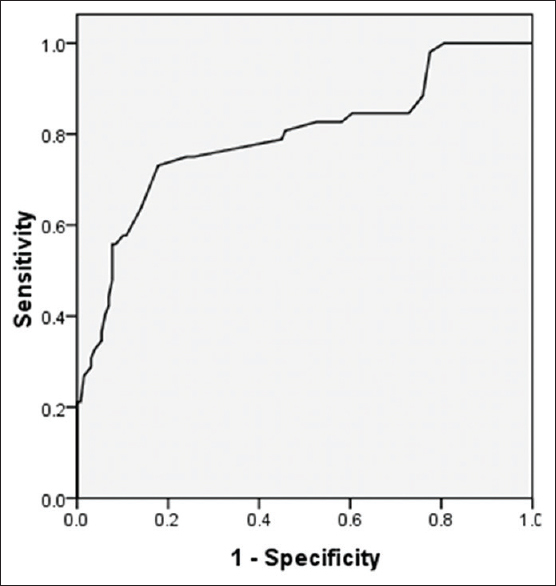 In Nigeria, screening for HSV-2 and co-infection with HIV in antenatal clinics is not routine. This study was undertaken to determine the seroprevalence and co-infection of HSV-2 and HIV among pregnant women. Methods: This was a cross-sectional study conducted at the antenatal clinic of the University College Hospital, Ibadan, between March and August 2013. A total of 270 consenting pregnant women were enrolled. 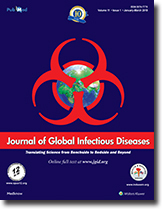 The study involved collecting socio-demographic data and laboratory determination of HSV-2 immunoglobulin G (IgG) and HIV seroprevalence using type-specific third-generation enzyme-linked immunosorbent assay (DIAPRO Diagnostic Bioprobes, Milan, Italy) and Uni-Gold Recombigen/ALERE determine, respectively. Data analyses were done using SPSS version 20 (SPSS Inc., IL, USA). Results: The seroprevalence for HSV-2 type-specific IgG was 33.3% (90/270), and HIV antibodies were identified in 19.63% (53/270) of the women. The HIV co-infection was 38.8% (35/90) among HSV-2-positive women and 10% (18/180) among HSV-2-negative women. Majority of the HSV-2 positive women (62.2%, 56/90) presented in their 2nd trimester while 18.9% (17/90) in their 3rd trimester. Conclusion: The seroprevalence of HSV-2 in this pregnant population is lower than what is observed in some other Sub-Saharan African countries; however, HSV-2/HIV co-infection is high. The HSV-2-seronegative women are still susceptible to primary HSV-2 infection in pregnancy with increased risk for HIV co-infection and neonatal transmission. Background: Curcuma longa has strong anti-inflammatory effect. This study aims to evaluated the level of anti-Toxoplasma immunoglobulin G and immunoglobulin M (IgG-IgM) antibody after intervention with C. longa extract in early pregnant mice with acute toxoplasmosis. Materials and Methods: We evaluated 20 early pregnant mice that were divided into five groups, four mice in each. Group 1-4 received injections of Toxoplasma gondii tachyzoites. Three days later, G1 and G2 were given orally 125 mg/kg/day and 500 mg/kg/day of C. longa extract, respectively. G3 was given 60 mg/kg/day of spiramycin (positive control), and G4 was given 0.2 ml of distilled water (negative control). G5 underwent no intervention at all. 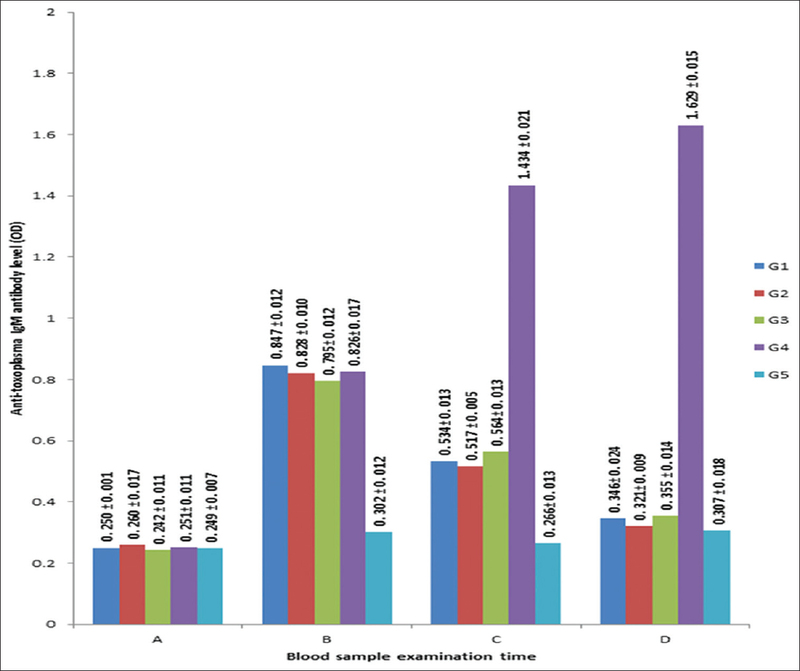 Blood samples were obtained serially (before and 3 days after injection of tachyzoites, 3 days and 7 days after intervention) to assess anti-Toxoplasma IgG-IgM antibody levels by enzyme-linked immunosorbent assay methods. Results: Anti-Toxoplasma IgG-IgM antibody levels increased significantly 3 days after injection of tachyzoites (P < 0.05), but decreased significantly (P < 0.05) 3 days, and 7 days after administration of C. longa extract dose 125 mg, 500 mg, and spiramycin 60 mg, and there was no significant difference between these three groups. Anti-Toxoplasma IgG-IgM antibody levels increased significantly (P < 0.05) 3 days, 6 days, and 10 days after injections of tachyzoites on G4. The IgG-IgM antibody levels fluctuated on G5 and considered as insignificant (P > 0.05). Conclusion: The administration of C. longa extract at a dose of 125 mg/kg/day for 7 days effectively decreased anti-Toxoplasma IgG-IgM antibody level in early pregnant mice with acute toxoplasmosis. Context: Although the incidence of invasive pneumococcal infections in children has decreased since the introduction of pneumococcal conjugate vaccines (PCVs), the appearance of serotype replacements has continued to increase. Aims: We examined the frequency of serotype replacements in adult cases of pneumococcal pneumonia. Furthermore, the transition in the coverage of vaccine serotypes (VTs) to non-VTs (NVTs) was also examined. Settings and Design: We investigated all confirmed cases of pneumococcal pneumonia in 303 adult patients admitted to Yamagata Saisei Hospital between April 2006 and March 2015. Materials and Methods: Pneumococcal serotypes were determined by testing for a specific type of antiserum using the capsular swelling method. Statistical Analysis Used: Chi-square tests were used to compare patient characteristics. Results: Annually, the number of admitted patients ranged from 24 to 43, with most of them being men (64.7% of the total patient cohort). Although many cases involved some underlying conditions, the rate of pneumococcal vaccination remained low. The average rate of multigeneration housing was high (37.6%). The rates of pneumococcal vaccine coverage declined since 2013 (7-valent PCV (PCV7), 18.5%; PCV13, 59.3%; and 23-pneumococcal polysaccharide vaccine (PPSV23), 66.7%) and were <50% for each vaccine (PCV7, 4.7%; PCV13, 32.6%; and PPSV23, 48.8%) in 2015. In addition, the VTs were replaced with NVTs in 2015 (48.8% vs. 51.2%). Conclusions: The frequency of NVTs in adult pneumococcal pneumonia increased in 2013, with the frequency exceeding that of the vaccine forms in 2015. Regular PCV vaccination of children and multigeneration housing seem to be associated with this reversed trend. Introduction: Antibiotic-resistant infections have become increasingly prevalent nowadays. As a result, it is essential to examine the key socioeconomic and political factors which contribute to the rise in the prevalence of antibiotic resistance in developing and developed nations. This study aims to identify the various contributors to the development of antibiotic resistance in each type of nation. Methods: PUBMED was used to identify primary research, systematic reviews, and narrative reviews published before Jan 2017. Search terms included antibiotic resistance, antimicrobial resistance, superbugs, multidrug-resistant organisms, developing countries, developed countries. 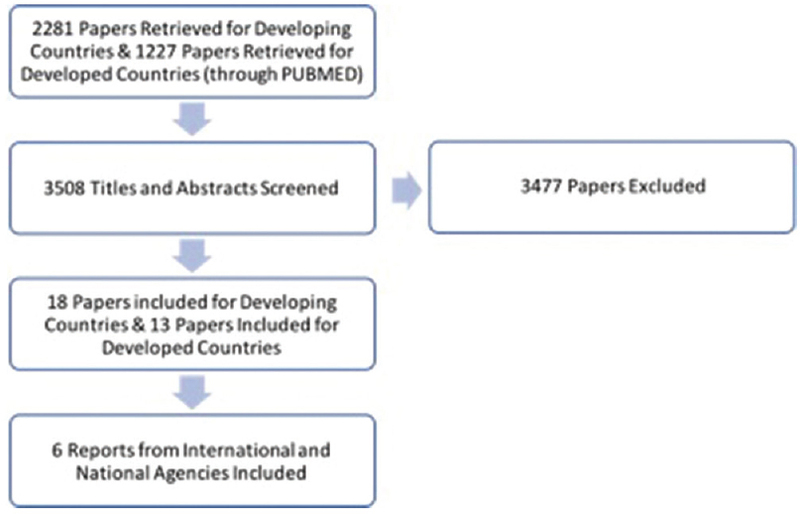 Publications from different countries were included to ensure generalizability. Publications were excluded if they didn't mention factors causing resistance, focused on the molecular basis of resistance, or if they were case reports. Publicly available reports from national and international health agencies were used. Results: In developing countries, key contributors identified included: (1) Lack of surveillance of resistance development, (2) poor quality of available antibiotics, (3) clinical misuse, and (4) ease of availability of antibiotics. In developed countries, poor hospital-level regulation and excessive antibiotic use in food-producing animals play a major role in leading to antibiotic resistance. Finally, research on novel antibiotics is slow ing down due to the lack of economic incentives for antibiotic research. Conclusion: Overall, multiple factors, which are distinct for developing and developed countries, contribute to the increase in the prevalence of antibiotic resistance globally. The results highlight the need to improve the regulatory framework for antibiotic use and research globally. Ecthyma gangrenosum (EG) is a rare, infective skin disease, predominantly but not exclusively caused by Pseudomonas aeruginosa. It is often seen in individuals with immunosuppression, although it has also been reported among previously healthy individuals. It was initially thought to be pathognomonic of P. aeruginosa septicemia, but this assertion was discarded following several reports on EG without bacteremia and EG with varied bacterial and fungal etiologies. There are scant reports of its association with human immunodeficiency virus (HIV) infection, while ocular involvement is extremely rare. An extensive search of the literature also found no report on EG, nor its relationship with HIV/acquired immunodeficiency syndrome (AIDS) from Sub-Saharan Africa. We hereby present a fatal case of multiple EG lesions in a 44-year-old Nigerian female with AIDS in the absence of bacteremia and review the literature of its association with HIV/AIDS and its concurrent orbital involvement. Spilled gallstones during laparoscopic cholecystectomy (LC) are common. Lost gallstones can lead to complications such as intra-abdominal abscesses, which can occur days, months, or even years after the procedure. Citrobacter koseri belongs to the family of Enterobacteriaceae. It is a low-virulence pathogen; however, it is linked to infections of the urinary tract and abdomen. We report the case of a 70-year-old diabetic male who presented with C. koseri- associated subhepatic abscess. Two years prior, he had emphysematous cholecystitis and liver abscess caused by C. koseri. During his LC, gallstones were spilled in the abdominal cavity and every effort was made to retrieve them. However, 2 years later, an aspiration of the subhepatic abscess revealed cholesterol fragments. We hypothesize that dislodged cholesterol gallstones and bile, contaminated with C. koseri, were the culprits for the appearance of the subhepatic abscess with the same organism 2 years after the LC.